On Wednesday and Thursday I was at the offices of the Forum voor Amateurkunsten in Gent, Belgium – the Flanders equivalent orgaanisation to Voluntary Arts. On Wednesday afternoon Katrien De Bruycker from Forum, who co-ordinates the Week of Amateur Arts in Flanders, and I were joined by Tom de Rooij who is now running the Week of Amateur Arts in The Netherlands as an independent organisation. We compared notes on the 2013 Weeks of Amateur Arts and Voluntary Arts Week. The Week in Flanders, in May 2013, involved 190 local authorities (two thirds of all towns) and a total of 750 activities. The role of local co-ordinators, either working for or supported by local authorities, is a key factor in ensuring this level of activity. Funding cuts in The Netherlands this year reduced the number of participating towns and cities from 125 to 65 but the Week still managed to generate a massive 4,500 activities involving 20,000 amateur artists. Our Voluntary Arts Week in the UK and the Republic of Ireland still has some way to go to match these statistics – but is a much newer initiative and will undoubtedly grow over the coming years. We swapped ideas for campaigns and themes for future Weeks and started to plan an EU funding application to develop more links between the Weeks of Amateur/Voluntary Arts in Flanders, The Netherlands and the UK & Ireland. Also on Wednesday I met Bieke Vanlerberghe, who last year succeeded Kaat Peeters as the Director of the Forum voor Amateurkunsten. We talked about ways in which our organisations might work closer together and how we could help to support and develop Amateo – the European Network for Active Participation in Cultural Activities. On Thursday Bieke, Katrien and I were joined at the Forum voor Amateurkunsten by Wim Verwoort, who is the Week of Amateur Arts co-ordinator for Antwerp, and Katrien Boogaerts, the co-ordinator of Kunstwerkt – one of the nine main amateur arts umbrella bodies for Flanders, which supports amateurs engaged in the visual arts. This helped me to understand the particular roles that local co-ordinators and artform umbrella bodies play in the annual Week of Amateur Arts. We talked about the prospects for developing a similar system of local co-ordinators for Voluntary Arts Week in the UK & Ireland and the possibility of running a Facebook-based art competition (along the lines of our recent ‘Life Imitating Art’ initiative) as a joint international project. On Tuesday I was at the Grand Theatre in Blackpool to speak at the Knowledge Exchange Network’s seminar on Arts Participation, Volunteering & the Big Society. Leeds Metropolitan University was commissioned by Arts Council England to coordinate a Knowledge Exchange Network and a series of seminars exploring key issues in participation and engagement in the arts across the North of England. The work is being coordinated by Leila Jancovich, from the UK Centre for Events Management, and Professor Franco Bianchini from the Cultural Planning and Policy Unit in the School of Cultural Studies. Tuesday’s seminar attracted an audience of around 40 people which included academics and a wide range of arts professionals and volunteers. I spoke about our RSC Open Stages project and the need for better connections between the amateur arts, professionally-led community arts and outreach work from arts institutions. Creative Producer Stella Hall described her experience of working with volunteer performers in several mass participation projects. Janet Berry, the new Programme Director of One Blackpool, gave us a summary of the Government’s Big Society agenda and its practical manifestations. Finally, Clore Fellow Sarah Stannage described her research with volunteer-led museums across Norfolk. These presentations provoked a thoughtful and fascinating discussion, with the diverse range of viewpoints present helping to develop our thinking on arts participation, the voluntary sector, volunteering, local democracy and much more. On Tuesday morning I visited Wyre in Lancashire where the local authority arts officer, Chris Wyatt, gave me a tour of his area. Wyre, with neighbouring Blackpool, is the focus for one of the first Creative People and Places consortia. Wyre is a largely rural area around the River Wyre, between the Bowland Fells and the coast, and includes the towns of Poulton-le-Fylde, Garstang and Fleetwood. We visited the Garstang Arts Centre, a beautifully converted old school building, to meet the Chair and Secretary of Garstang & District Arts Society. The Arts Society is a very impressive volunteer-run organisation that runs the Arts Centre and boasts around 15 affiliated amateur arts groups and nearly 400 individual members. Their programme of activities includes photography, calligraphy, folk dance, floral art, a community choir and a big band. We talked about how Garstand & District Arts Society might be able to get involved in the Creative People and Places programme to increase arts engagement in the area. 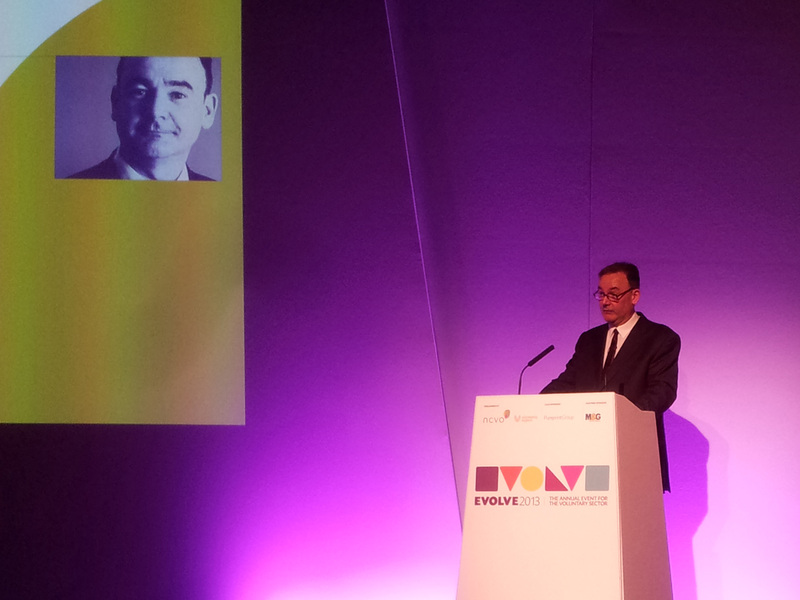 On Monday I was at The Brewery in London to attend ‘Evolve 2013: The annual event for the voluntary sector’. This was the first annual conference of the National Council for Voluntary Organisations (NCVO) since the organisation’s merger with Volunteering England. It was a bigger event than normal – with more than 1000 delegates – and had an obviously increased emphasis on volunteering issues. 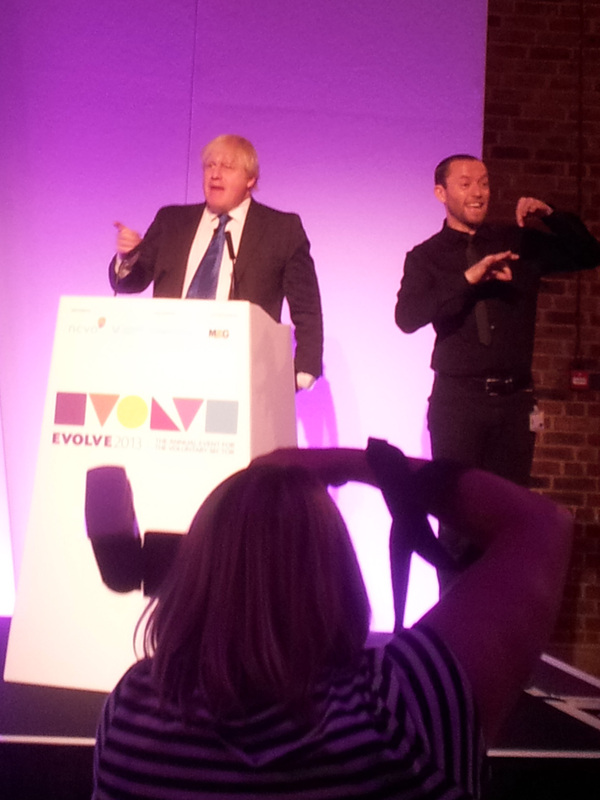 The morning session included a speech by the Mayor of London, Boris Johnson, who said “volunteering is good for our society: it helps to bind communities together”. He thought it was “critical to raise volunteering up the political agenda”. It was fascinating to see Boris Johnson in action. He is very entertaining, genuinely funny and self-deprecating, though it was interesting that he said very little about the effects of austerity or public funding cuts. I then attended a seminar on ‘Technology and Social Action’ in which three speakers looked at the effects of the digital revolution on civil society. Helen Goulden, Executive Director of the Innovation Lab at NESTA, spoke about technological trends in relation to giving, including the concept of ‘behavioural targeting’. Karl Wilding, Head of Policy & Research at NCVO, looked at what this means for the voluntary sector, including whether ‘membership’ is still relevant in the digital age. Finally Emma Jane Cross from The BB Group (Beat Bullying) spoke about how her organisation is scaling its support by using online social networks. A really thought-provoking set of presentations which generated an interesting discussion. In the afternoon NCVO Chief Executive, Sir Stuart Etherington, gave his annual ‘state of the sector’ speech. He said “this isn’t an easy time for voluntary organisations and the voluntary sector: times are tough … The [London 2012] Games lifted the cloud of limitation from people’s lives … volunteering is central to my vision for the sector and this is an opportunity that is too good to miss”. Stuart suggested that the brand ‘Big Society’ has become like “an embarrassing uncle” and reminded politicians that “listening to our experience and involving us should be a necessity, not an afterthought”. His rallying cry was that “now is the time for the voluntary sector to speak up. We have a good story to tell – let’s make sure we tell it … Helping Government solve problems is not acquiescence. Campaigning is something the public believe we should do”. In the final session of the conference we heard from John Cruddas, Shadow Cabinet Minister and Head of the Labour Party Policy Review. Looking at how we rebuild social capital in the current climate he outlined ten points for consideration. He said “we need a politics that values relationships and wellbeing: we need to reduce social poverty”. He went on to ask “as the state withdraws, how can we reconfigure to create new minimum standards? How can we socialise delivery?” In response to a question from the audience, John Cruddas claimed “I’m probably the last person standing that still believes in the Big Society”. His responses to questions were considered and thoughtful and he was clearly keen to listen to the views of the voluntary sector in preparation for developing the Labour Party Manifesto for the next General Election. I was back in London on Wednesday to meet Femie Willems and Julia Terlunen from the Netherlands Cultural Participation Fund. In the Netherlands, rather than having a single Arts Council, Government funding for the arts is distributed through several thematic funding organisations. The Netherlands Cultural Participation Fund supports work to encourage participation in schools education, in the amateur arts sector and to develop emerging professional talent. It also operates an international strand of funding focussed on the neighbouring countries (Belgian Flanders, Germany and the UK). Femie and Julia had been spending a few days in London meeting representatives of Arts Council England, the Crafts Council, the Paul Hamlyn Foundation and others to discuss the potential for working with the UK to develop and support arts participation. We spoke about the UK voluntary arts sector, the links between our Voluntary Arts Week and the Week of Amateur Arts in Flanders and the Netherlands and possible areas for further co-operation.